If you have not yet had much experience with the world of investment, then the first thing that occurs to you when visiting our pages is the question “Why buy silver?“ You will also ask yourself “should I buy silver as a precious metal? Or is it more of an industrial metal? Sliver is unique by the fact that it is both – a precious metal and an industrial one. It is important to stress other important considerations – the idea of buying silver as a form of money that is like a monetary metal. What actually is money today? Not only the notes in your wallet. It is written in every economic textbook that money is the means of exchange, allowing the valuation of property and it serves as the preserver of values. We would beg to differ with the last statement. Today’s money, which is not covered, perform their function as preserver of values extremely badly if at all. The nightmare for everyone, even for those with only small savings is hyper-inflation. Hyper-inflation is usually the result of the country‘s irregular fiscal policy, that is, the debts of the country. To keep to its commitments, the government prints the owed money. For example the USA is heading towards this unhappy ending, where monetization of the country‘s debt. The American FED (the central bank) is buying bond papers released by the Treasury secretary (the ministry of finance). Of course even normal (and always present) inflation totally devalues the function of money as a preserver of values. Of course you won’t notice the difference in a year, but after a longer period of time you will. The fact is that a “creeping inflation” affects all of us. All of us are saving money for our pensions – either with the state social insurance or by means of voluntary pension funds. $1 in 2008 = $0.02 in 1908 – or, money in the USA lost 98% of its value in 100 years. The vast majority of this process happened in the last forty years, when the USA left the golden standard. The main reason of this phenomenon is the actual essence of money. 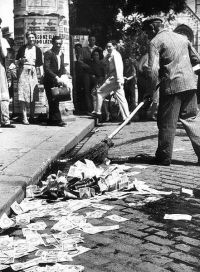 At the present time, all over the world we use „fiat money“ – That is unsecured money. That means that the money is not covered by any physical commodity or estate. Even the American Dollar which is a world reserve currency, and should therefore be stable, underwent fluctuation of tens of percent in the year 2008. That’s no surprise – today the official covering of the dollar is not "backed by gold", but "backed by the full faith and credit of the US government". The dollar is therefore only covered by the confidence in the country, which has increasing budget differences. The confidence in the country, whose debt of public budget is more than 11 billion dollars ($11,000,000,000,000). This system of unsecured currency works all over the world. "The stability" of currencies differs only by how big a debt each country has. Very surprising is the fact that people consider this system as normal. People believe that economies have worked this way for ever. The opposite is true. 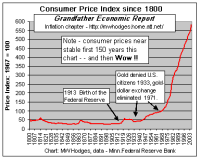 The system of unsecured currency has functioned for a relatively short time – from the year 1971, when the American president Nixon cancelled the dependence of the dollar on gold (the gold standard). Because the majority of the world currencies at that time were fixed on the American dollar, even they lost this dependency on gold. The reason was very simple. The gold standard did not allow countries to spend more than they could actually afford. That is why throughout history there was sometimes a short break from the gold standard, always during wars or political overthrows, when the counties were not able to finance excessive war or administrative expenses. The conclusion is very simple. Money connected to gold and silver has existed in the world for almost 6000 years. With today’s money - unsecured – countries have experimented with for only 40 years! That is such a short time, that we really cannot talk about a modern financial system, only about one big economic experiment. Do even you really want to be a part?